Congratulations to Isaac Albin, who is the recipient of the 2019-2020 St. Damien of Molokai Scholarship. This award is granted to a current 9th, 10th, or 11th grade student that has completed his/her service hours at Bishop Neumann and has gone above and beyond in the service of others. Isaac is the type of student who leads quietly by example. He has a strong work ethic and is very responsible. Isaac has gone above and beyond the required service hours and has done a variety of service. Some of these are helping with the St. Wenceslaus Fall Festival, working at the Bishop Neumann music contest, cleaning the church, and serving the elderly with yard work and snow removal. Any family who missed the April 15, 2019 deadline for the Diocesan Good Shepherd Scholarship and needs assistance please visit: https://online.factsmgt.com/signin/4HMJ7 it is the location where any family may begin the application process for either a Needs-Based Scholarship or a Non-Financial Need Scholarship. Our Guardian Angel Scholarship will be closely tied to the Good Sheperd Scholarship. Some funds may be available after those scholarships are distributed. In order to apply to those scholarship you need to go to FACTS, the cost is $35 per family. By using FACTS we will be able to distribute scholarships in a much more equitable way while maintaining the confidentiality of each family’s financial circumstances. The deadline for these scholarships is June 15, 2019. Scholarships will be distributed July, 2019. I pray you have a blessed and peaceful summertime. 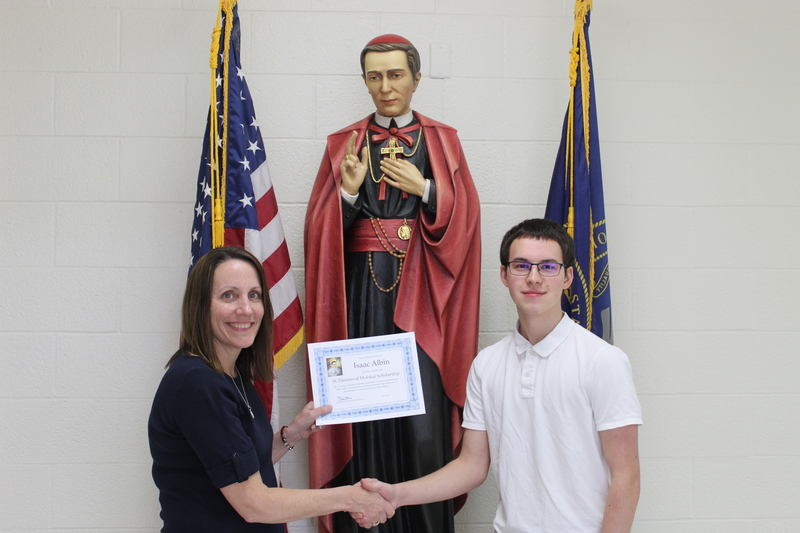 Congratulations Isaac, thank you for being an outstanding Bishop Neumann role model!